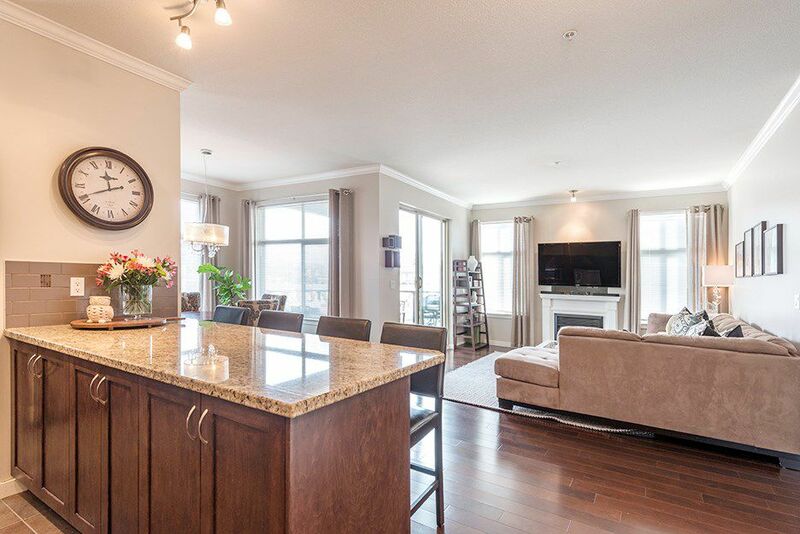 Rarely available corner unit at Centrepointe! A much sought after Whistler style building. One of the largest layouts with 2 bedrooms, a den & 2 full bathrooms. Shows beautifully! You'll love the open concept with 9 ft. ceilings, gourmet kitchen with granite counters, a huge breakfast island with bar seating & stainless steel appliances. Spacious living room, cozy fireplace & a unique separate formal dining room. Gleaming hardwood floors, crown moldings & designer paint throughout. Master bedroom with a walk through closet leading to the lovely ensuite. Nicely separated bedrooms. Insuite laundry. Large covered balcony. Rainscreen construction & balance of New Home Warranty to 2018. Two s x s parking spaces. Guest suite. Steps to the Village, trails, parks & transit. A home to be proud of!